Up to the minute Race Day information can be found at sirwaltermiler.com/2018info and on the Summer of Miles podcast, which is posting daily episodes leading up to the event. The Pre and Postrun race party will be hosted within walking distance of the track at Raleigh Brewing Company, starting at 6pm. Wicked Weed Brewing (Run for El Dorado Pale Ale), Hopfly Brewing Co. (Beach Beach), and Raleigh Brewing (Sir Sandman Kolsch) have brewed exclusive, runner-friendly beers to raise money for the Kay Yow Cancer Fund. Bo’s Kitchen, Arepa Culture, and the Webby’s Shaved Ice food trucks will be in the Raleigh Brewing parking lot as well. 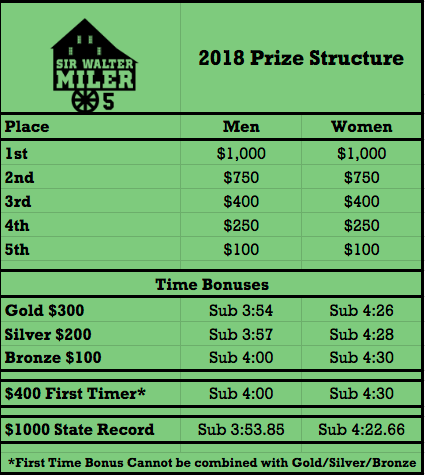 The 2018 Sir Walter Miler will include the deepest prize money to date with $5000 in guaranteed money plus $15,000 in bonus incentives, that includes the JDL Fast Track State Record Bonus ($1000), Gold (Sub 3:54 Male / 4:26 Female), Silver (Sub 3:57 / 4:28), Bronze (Sub 4:00 / 4:30), and First Timer Bonuses for those athletes breaking the 4:00 / 4:30 barrier for the first time. The Sir Walter Miler has had 26 sub 4:00 performances and 9 sub 4:30 performances since its inception in 2014. The last time the 4:00 barrier was broken in Raleigh before then was 1974. No Woman had ever broken 4:30 in North Carolina before 2015.